While the legal and technical aspects of Medical Aid in Dying (MAID) are complex, dynamic, and often misunderstood, the emotional, religious, and ethical conflicts tied to it are just as relevant to the political and social landscape, particularly within the United States. Assisted death dates back millennia with examples presented even in the Bible, but as medicine and technology have evolved, so too have the questions of a healthcare practitioner’s involvement in assisted death and the legalization of such a practice. This event will begin with a screening of Living While Dying, a 45-minute documentary in which filmmaker Cathy Zheutlin sets out on a brave quest to face mortality. Living While Dying portrays the stories of several individuals living with terminal illness, who greet their deaths with courage, humor, creativity, and acceptance. Though the subject is difficult, the film is surprisingly uplifting. “Dispelling traditional fears and expectations about death, Living While Dying invites us to reimagine and set the stage for our own inevitable endings,” situating itself perfectly within the scope of Reimagine. 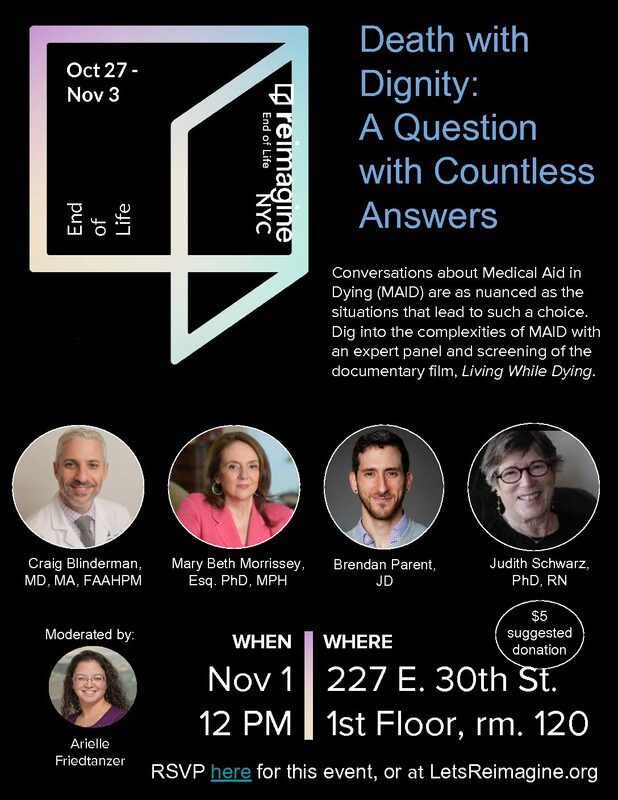 After the film, our panel of professionals, including EOLCNY’s Clinical Director Judith Schwarz, will strive to unravel some of the myths and misconceptions around MAID, to lay out the indisputable facts and figures, and to offer perspectives and opinions on all sides of the aisle, in the hope that attendees will develop their own informed positions on the issue.